Free range eggs. The term simply means the hens that lay them “have been allowed access to the outside.” And, in the real world of today’s egg-production, that can mean little more than a small doorway at the back of a crowded indoor henhouse. That’s where pastured egg producers enter the picture. 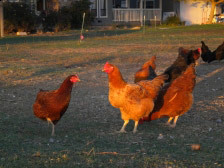 Pastured hens are truly free on the range; they spend the majority of their days pecking and scratching on open land, eating bugs, living like chickens are meant to. For Shelly McMahon of Shelly’s Garden, the market’s newest egg producer, that last part is pretty crucial. She’s in the process of expanding her egg business in Brentwood and is staunchly committed to keeping the birds on pasture. Although she and her husband grew oats on their 10 acres for a neighbor’s horse for the first decade they lived there, Shelly has been actively farming the land for 11 years. 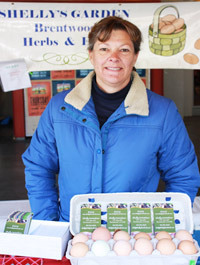 She started with herbs and tomatoes and kept some laying hens for her family. Soon she started giving eggs away to friends, and slowly began to see it as a potential business. 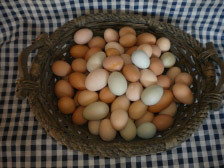 A few years back she arranged a deal with her neighbors at Knoll Farms to include her eggs in their CSA box. Today she’s managing a 1,200-bird flock. At the core of her process is the rotation of the hens. Every few days, she relocates them to a new part of the property. The pasture itself also needs care. In the summer months, Shelly irrigates portions of the land, corresponding with the rotation, or “just enough to ensure that there are enough worms and bugs.” She also sows an omega-rich forage blend on pasture; it’s a mix of grasses that includes flax, clover, and other plants that attract beneficial bugs. Thanks to practices like these, pastured eggs are said to have around 10 percent less fat, 40 percent more vitamin A, and 34 percent less cholesterol than those from factory farms. When Shelly and her husband moved to Brentwood, about 55 miles from San Francisco, in 1989, it was a community of six thousand. Since then they’ve watched the housing bubble expand and pop from within a designated agriculture corridor (a farming-friendly area where residents are barred from building commercially or subdividing the land into lots smaller than 40 acres). What was once clearly a rural area has become “peri-urban,” as recent development has crept to within a mile of their farm. While Brentwood agriculture is a draw for some Bay Area foodies who come to the area for u-picks and farm trails, there’s still a shortage of good local jobs in the area. But Shelly’s optimistic. She hopes to eventually transition the farm to certified organic — once she can afford to make the switch to organic feed for the birds, which would cost around twice as much as the custom blend of blend of corn, wheat, alfalfa, and oats she feeds them now. By expanding her business to include the weekday markets at the Ferry Plaza, as well as several new retailers, she also hopes to be able to take on more acreage and more hens. In addition to eggs, Shelly’s Garden will be offering a variety of culinary herbs (everything from stevia to cinnamon basil to cilantro Delfino) at the Tuesday market. When laying picks up for the season (by around late-May or early-June) she’ll also be joining us on Thursdays. Photos of Shelly’s Garden courtesy of Shelly McMahon.